Crews of California Opens Rock & Brews' First Airport LocationLos Angeles, CA (RestaurantNews.com) Today, Crews of California, a premier airport retailer and food and beverage operator at top airports, opened the first Rock & Brews airport location at Terminal 5 at Los Angeles International Airport (LAX). The emerging rock-themed dining and entertainment brand, co-founded by rock legends Gene Simmons and Paul Stanley of KISS, introduces an exciting new respite for airport customers, and marks the beginning of the brand’s expansion into airport locations. Officiated by Deborah Crews, Chief Operating Officer of Crews of California, and attended by Los Angeles’ city officials; airport officials; Rock & Brews founding partners Gene Simmons, Paul Stanley, Michael Zislis and Dave and Dell Furano; media; and, friends and family, the opening was a result of a four year effort on the part of Crews of California. Rock & Brews at LAX marks the fourth outpost for the expanding brand, following restaurant openings in Redondo Beach, Calif., Los Cabos, Mexico and its flagship location in El Segundo, Calif.
Rock & Brews Concert Bar at LAX offers both dine in or “Grab and Go” service. Guests with time to spare can take a seat, select from an array of signature dishes including various breakfast items, salads, pizzas, sandwiches, burgers and entrees, as well as a broad range of craft beers, while enjoying the concert-themed environment. For travelers on the run, Rock & Brews’ “Grab and Go” allows guests to take a rockin’ meal with them on their flights. 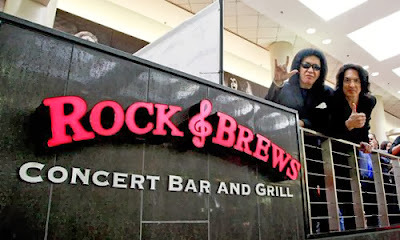 Rock & Brews at LAX is open from 5 a.m. to 11 p.m. daily. For information, call (424) 702-1619. Continuing expansion, several additional Rock & Brews are currently in development: Rock & Brews Paia (Maui, HI), Rock & Brews Prairiefire (Kansas City, MO), Rock & Brews Long Beach (Long Beach, CA) and Rock & Brews Albuquerque (Albuquerque, NM) are slated to open soon.